Looking for an interesting, scenic place for that special event? Something a little different, where the guests can enjoy the surroundings? Whether you are planning a wedding, a party, a company meeting, or a reunion, check out the places below for the ideal location for your event. You will find a variety of facilities to choose from, offering anywhere from full assistance with your event to do-it-yourself events. Imagine your wedding or event under giant oaks and lush grass, next to the beautiful spring-fed Hamilton creek. We have an amazing and affordable space for weddings and reunions here at Creekside. Rent the whole property for as little as $1075 per night! 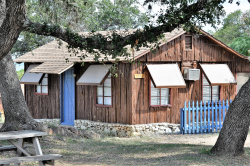 The large Grandview house and the other 5 cabins will sleep up to 48 guests. We can accommodate weddings up to 100 guests. 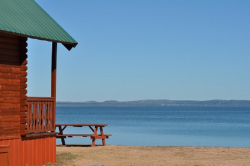 Willow Point Resort's family vacation cabins and large group Lake House are spread along the sandy shore of sparkling Lake Buchanan. 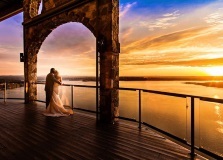 Their central Texas location, modern accommodations, direct lake access, and beautiful lake views create the ideal setting for family vacations, business conferences, and awesome Texas Hill Country weddings. 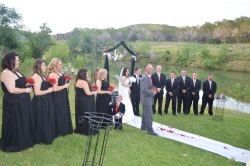 An ideal location on Lake Buchanan for your event. Lake cottages, boat rentals, floating fishing house, swimming pool, children's play area, fishing guide and charters are available. We offer a scenic setting on beautiful Lake LBJ for your next event. We can host events from small groups up to 600 people at our location. Only 45 minutes from Austin and 75 minutes from San Antonio. Some lodging is available.